The original hotel was a wooden structure, charmingly depicted by watercolourist Henry Gritten at the time when Abraham Howgate was the licensee after very brief stints by Robert McDuff and Frederick Poole. 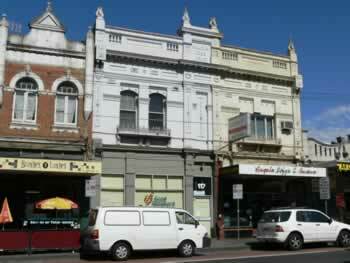 It was later rebuilt in two-storeyed Italianate style. James Page, a man active in local affairs and elected to council in the 1860s, was owner and licensee from at least 1861 until at least 1874. The owner until his death in 1910 was also called James Page, but may have been the son of the same name; both generations of the family lived at the hotel. "There was a rough class of customers at the place then but she cleared them out, refurnished the place, and made a new start. The trade was steadily growing, and the customers were all of a very respectable class." The hotel was allowed to continue trading continued trading but in April 1914 the Licenses Reduction Board handed down a decision that it was one of the hotels in excess in the Darling Ward. The upper floor exterior of the building is substantially intact although the windows of 115 have been altered; the name and construction date can be seen on the pediment in raised letters. The ground floor has been completely altered for subsequent offices and shops on the premises.